Diverse art practices have, since time immemorial, sought to establish a visceral link with the viewer’s insides in order to problematize order and disorder, normativity and aberration, totem and taboo, as even a cursory glance at Ghirlandaio’s portraits of decay, Bruegel’s depictions of disease, the Viennese Actionists’ performances with animal carcasses, or Athey’s ritualistic work with HIV-positive blood show. In all these works, the defilement, the disgust, and the horror are intentional, strategic—even ideological. But what of the unintentional, even decidedly unwanted, yet ceaselessly produced abjection? With its beautiful gardens, highly aesthetized yet functional architecture, and exceptionally rich occupational content, the Bethlem Royal Hospital, London, is the epitome of applied (“ethical”) aesthetics. The politics of egalitarianism and the respect for differential presence is here inscribed in all regulations, daily routines, and the individually tailored approaches to psychiatric care. And yet, this (utopian) construct is corroded by greasy fingerprints on the glass separating the nursing station from the ward; coagulated chewing gum found on walls and under tables; deep cuts in armchairs and sofas; and dents in the woodwork that act as reminders of the more violent attacks, as do, indeed, bruises on patients’ faces, necks, and arms. 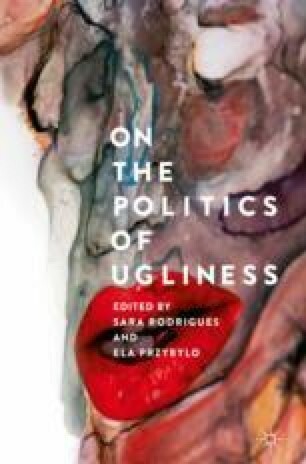 Fusing Nagatomo’s notion of the body as an actional-humoural process with Kristeva’s abjectness as sub-/ob-ject in exile, and Rozin’s theories of disgust, this chapter queries the relation between applied aesthetics, politicized sociality, and (covert) stigmatization. It argues that stigmatization occurs behind the scenes, in looped somaesthetic processes, as a byproduct of sensorial, behavioural, and environmental ugliness. In acknowledging this state of affairs, the chapter also articulates the relationship between the (vulnerable) somatic body and the vulnerability of the (neoliberal) institutions of care.